The Dallas Cowboys selected North Illinois offensive tackle Doug Free with their 2nd pick in the fourth round of the 2007 NFL Draft (#122 overall). He’s the second offensive tackle taken by the team with their first four picks. Strengths: A tall offensive tackle with adequate bulk and even more room on his frame to get bigger. He does a good job with his first step and blocking angles in the running game. He shows outstanding quickness and mobility for his size. Is an agile offensive lineman with the ability to consistently reach the second-level and hit the moving target in the running game. He gives a great effort on every play and will impress you with his motor. He shows good quickness in his set and rarely will get beat by speed off the edge. He also plays with good balance and body control, which allows him to shuffle laterally versus double moves. Displays good awareness in pass pro, as well. He has great experience and has been a durable player throughout his career. He also has dominated the mid-major DI-A level for the last two seasons. Weaknesses: Lacks ideal bulk and will struggle to anchor versus bigger, more powerful bull rushers. Base is somewhat narrow and he must learn to play with more consistent leverage. He has adequate-to-good overall strength but lacks explosive upper body power. Has not played against top competition on a weekly basis at the collegiate level. Will have a little bit of a bigger transition to the NFL as a mid-major player than some of the other top OT prospects from powerhouse DI-A programs. Overall: Free made 12 starts as a true freshman in 2003 at left tackle (including two at tight end). 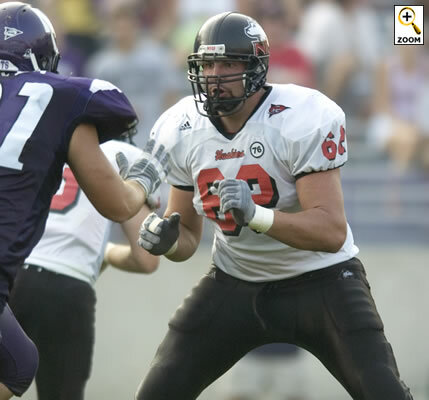 In 2004, Free played in and started all 12 games for the Huskies at tackle. Free became an All-MAC First Team performer after the 2005 season when he once again started all 12 games, giving him 36 consecutive starts over the past three seasons. In 2006 Free started all 13 games at left tackle, ending his career with 49 straight starts. Free suffered a stress fracture in his foot in the season opener (Ohio State) that lingered throughout most of his senior year. As a result, he did not look as agile as he did on film from the previous season. Even when at full strength, Free has never been an overpowering blocker and he will need to improve his strength in order to sustain blocks longer in the NFL. With all that said, Free is still worthy of first-day consideration because of his impressive combination of size and mobility. He draws many comparisons to former Northern Illinois OT Ryan Diem, who currently starts at right tackle for the Colts, but Free is a significantly better prospect now than Diem was in 2001. In his second post, he asks, “Will this be Flozell’s final season in Dallas?” He observes, “The Cowboys might not be running Adams out of town, but they sure are preparing in case he does leave. And they’re positioning themselves so that Adams won’t be able to hold them hostage in contract negotiations.” Quite right. And a good deal. Free is on The Ticket, talking to Norm Hitzges, Goose Gosselin, and others. Hitzges asks Free why he thinks he fell so far, since he was considered a 2nd or 3rd round possibility. Hitzges notes that the Cowboys “took about 9 seconds” to make this pick and were high-fiving themselves that Free fell this far. Indeed, Free was the #77 prospect on Gosselin’s board. That’s pretty good value at #122. Interestingly, James Marten, picked by the Cowboys in the third round yesterday (#67), was ranked 85th. POSITIVES: Smart, alert lineman who stands out in pass protection. Displays a lot of quickness, recognizes blitzes and is an outstanding position blocker who makes effective use of angles. Stays square, keeps defenders in front of him and fights with his hands. NEGATIVES: Not a dominant run blocker nor a true finisher. More of a finesse lineman than an outright mauler. Suffered a stress fracture in his foot early last season that hampered his play all year. ANALYSIS: Formerly a tight end, Free has grown into a terrific offensive tackle. Offers a lot of upside for the next level yet may be incorrectly evaluated because of his injury last season. Possesses starting potential and is a bargain outside of the first round. Cowboys fourth-round pick Doug Free is often compared to fellow former Northern Illinois tackle Ryan Diem, who starts at RT for the Colts.